If you're looking for an alternative to the annual cherry blossom frenzy at the Tidal Basin, National Harbor has doubled its collection of cherry trees. And many are just about to show their pink stuff. Before 2018, some 100 cherry trees of different varieties could be found around National Harbor including at Gaylord National Resort and Convention Center. Then, last year, National Harbor planted 100 Okame cherry trees, and this will be the first year to enjoy their full splendor. 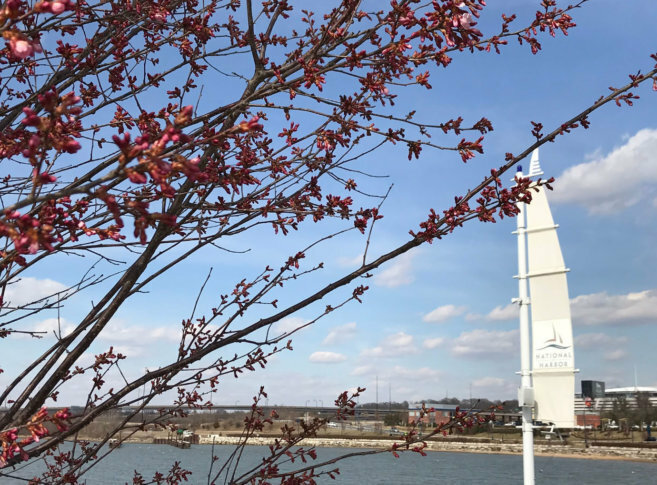 “Right along the trail, the Harbor Trail that takes you to Woodrow Wilson Bridge, you’ll see the … trees, and they are getting close to being in bloom,” said Deborah Topcik, National Harbor’s marketing director. You’ll also find some seasonal additions indoors at Gaylord National Resort. Starting March 23 and continuing through late April. More than 200 spring flowers including daffodils, lilies and tulips will be on display in the resort’s soaring garden atrium. As part of the National Cherry Blossom Festival, National Harbor and the Japan-America Society of Washington will host Sakura Sunday on April 14, a free festival spotlighting Japanese culture. And throughout the cherry blossom festival, the Capital Wheel will glow pink, and the Fleet Street Lights — a free 30-minute nightly show featuring 4,300 lights suspended over the street — will be programmed in pink.